… I miss you; like nobody else in the heeeaaat of suuuummer sunshine… OK. I’ll stop, but that’s my absolute favourite Corrs song. So you may have noticed, it’s pretty hot! I’ve banished the duvet to the garage; I have a tower fan following me everywhere I go in the house and I worry passing the windows in fear of bursting into flames like a vampire. I went to a friend’s house last weekend and quite painfully burnt myself, resulting in a red face and a farmer’s tan. Needless to say, I miscalculated my SPF. Love, love, love, love, love. I love it. I hate that SPF products always make my oil-prone T-Zone shiny and with UVA/UVB protection and a whopping great SPF number; I’m in love. Set on a base of La Roche-Posay thermal water, it’s just delicious and perfect for sensitive skin. This is probably one of my favourite products of 2014 full stop. The 50ml tube costs a mere £14 and currently, if you buy any 2 Anthelios products from Escentual, you get a free Spray Thermal Water another summer essential – I ended up drinking one once on an unexpected hike; long story! I swear this product is older than time itself. I remember this as a little kid on holiday with my parents; this is the smell of holidays (although is 100% fragrance free). It sinks into the body leaving it smooth and nourished but not oily. SolarSmart technology helps prolong the time it takes for the sun protection to degrade as well as keeping it a little more fixed as you sweat (still keep reapplying though). Again, UVA/UVB protection and also great for sensitive skin. The bottle is 150ml lasts forever and costs just £20 here from Boots.com (think of the points!). Not as matte as the Anti-Shine, but by no means greasy/shiny. This gives a lightly tinted glow to the skin and perfect if you’re just starting to tan but also great to unify a sun-kissed complexion. Again, high SPF50 protection and great for sensitive skin. Anthelios XL Tinted Fluid is just £14.45 here at Escentual. Vichy products flare up my skin like nobody’s business; seriously, reaction central and with the rest of their products, if you’re sensitive, I’d say to avoid them (if you’re not, then by all means use and love them; they receive incredible feedback and reviews). However, Vichy Capital Soleil products do seem to suit my skin down the ground; they’re awesome and Vichy Capital Soleil After Sun is a life saver. After my ‘burn incident’ last week, I cleared up the burn, peeled and returned to pretty much normal in 3 days and I put every second of that down to this (also Clinique Redness Solutions Daily Relief Cream for my face). Keep it in the fridge; it smells great; non-greasy and does the job. A winner. Still can’t get over that it’s only £9.50 for a long-lasting tube here from Escentual. BB creams are a guy’s best friend. They unify complexion, don’t look, sit or feel like makeup and keep us looking great. Vichy Capital Soleil BB cream is very sheer (light coverage) and is definitely more of an SPF with BB properties than a BB with an SPF (if that makes sense). It sits very, very well on the skin; feel hydrating but doesn’t leave you at shine-central. An absolute cinch of a deal at just £12.30 here from Escentual. Last year was L’Occitane’s year, with the launch of the Collection de Grasse and the revamping of their awesome (in the true sense of the word) Divine skincare collection. However, with launches almost every month, I think they’re getting a bit carried away with quantity rather than their reputation for quality and in 2014, none of the releases have particularly floated my boat (the brightening collections and soft creams were good!). I was hugely looking forward to the au Brésil range and have been pretty disappointed; it’s just a bit, “meh”; I have honestly nothing more to say than that. But, the Jenipapo Face Veil is excellent. A bit OTT on the fragrance but it fades away quickly and isn’t at all unpleasant (just avoid if you’re sensitive). Jenipapo Face Veil SPF30 sinks into the skin and disappears without a trace; it’s probably the most unobtrusive SPF I’ve ever come across. Jenipapo Face Veil SPF30 is £26 here from L’Occitane. This article first appeared on MANFACE written by Thom Watson. It was published on Tuesday 22nd July 2014 and was last updated on Monday 3rd April 2017 at 1:59pm. It's categorised under Clinique, La Roche-Posay, L’Occitane, Sun Protect, Vichy where you'll find more related content. Top notch info. Always looking to stay up on sunblocks. But, I have one question: Did you really catch a sunburn at your friend’s last week or did you add that part to bring home the point of this post? ;-) Also, are any of these mineral-based sunblocks? Yeah, guess it was two questions. Hi Jody. I honestly, 100% did burn myself, on my Twitter feed somewhere there’s a picture of me with the terrible farmers tan that followed it. Also as far as I’m aware, none of them are purely mineral based and all use a combination of mineral and chemical. 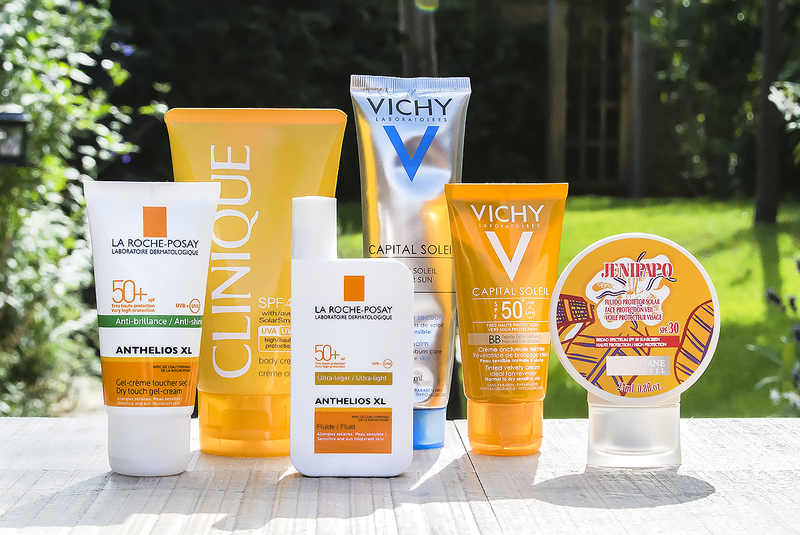 I swear by the Vichy Capital Soleil range! My holy grail sunscreen. La Roche Posay (especially the fluid one) leaves a horrible white cast and has a nasty rubber texture which does not sink into the skin – dries way too fast! Thanks for this Thom. I’ll try the Vichy — sounds a bit more ‘now’ than the days when mother used to baste me with Ambre Solaire! Haha, it’s very ‘now’ for sure Brent. There’s almost always an offer on them down at Boots too. Plus, I challenge you to find a pharmacy on the continent that doesn’t stock them! Couldn’t agree more on the L’Occitane SPF veil – I’m loving mine and it is so portable. Tempted to try the Vichy BB cream now – sounds great. Loved the post!